When I first bought the house, the laundry room was a disaster. There were significant issues inside two of the walls, as well as under the floor. I say under the floor because this room was clearly not in the original blueprins, it was an addition. But now that I have pictures from the original owner, it was in the original framing. It is cantilevered over the foundation sill, jutting into the garage. This is the root of many of the issues; I don't believe this room was part of the original drawings. It appears it was added by the builder, and done without proper planning for plumbing. Its issues were aggravated by some foolishness on the part of the previous homeowner plus the lack of winterization. The previous homeowner added a utility sink in the garage, and to do so he cut a notch out of the foundation and the sill plate. That might not have been so bad if he had not also left it unsealed, and hence created an entrance for mice. Of course, given that the feed pipes and waste line were not insulated or heated, they all burst in the winter. And as near as I can tell, it's been that way for many years. In addition, he ran Schedule 40 PVC for the sprinkler system. I'm not sure which part of "NOT FOR PRESSURIZED APPLICATIONS" written down the side of the PVC pipe he didn't understand. At any rate, that was all cracked in the garage as well. He also terminated the dryer duct with a piece of pantyhose as the lint filter in the garage, on the end of dryer flex duct. Given that there was a gas line in the laundry room, I have a bad feeling he was ducting burned gas fumes into the garage. There was a pipe heater installed on the feed water pipes for the washing machine where they run between the joists, in the area that overhangs the garage slab. It was installed incorrectly, and given that there is no outlet nearby, I've no idea how it was plugged in (extension cord?). You're not supposed to coil the pipe heater around the pipe, but he did. You're also not supposed to use the same heater for two runs, but he did that too. The warnings are very clear on the front of the package. These things are not expensive, I don't know why he didn't buy two and run them correctly. Of course he had to do this because the builder's plumbing was not planned. At some point,a significant part of the laundry room floor joists were left open to the garage, but had a piece of plywood nailed (though barely) to the bottom. This in essence was a giant mouse condominium, and they moved right in. He left a gaping hole in the subfloor (hidden by the underlayment), which I believe was for the original dryer duct that was routed correctly into the basement and out the rim joist. He cut a new hole in the base plate of the wall for his dryer duct. But he also cut out a huge part of the drywall _and_ the sheathing from the garage side, and never replaced either. He then vented his dryer into the garage, instead of into the vent piping that was already in place. The dryer vent elbow was a crumpled mess. It appears he chose to destroy the wall to accomodate a $3.00 dryer duct and to avoid having to redo the hackery for the garage utility sink and the sprinkler system piping that burst. The trap for the washing machine standpipe was inside the wall, and was cracked. The drywall that covered it was water damaged, as was the underlayment and part of the subfloor. So presumably this happened long before the bank took possession; they would have no reason to use the washing machine standpipe, and the water damage was more significant than what would have been caused by just water from the trap freezing and emptying once. The underlayment was stapled down with narrow crown staples. This isn't the correct fastener for underlayment; nearly all of the staples went right through the underlayment and were not holding it down at all. I pulled it all up quite easily with just my hands, no pry bar necessary. The funny thing about all of this... given all of the other work needed on the house, I might not have found some of these problems until the first time I tried to do laundry (and found that the wastewater dumped out into the wall through the large crack in the trap). However, I chose to buy the largest consumer washing machine and dryer on the market (because I hate doing laundry), and the washing machine has an irreversible door. Further, the gas pipe sticking out of the floor was going to be in my way, and the existing utility tub and cabinet were too wide to accomodate the new machines. So I needed to do a little reconfiguration to accomodate the new machines (swap the location and make more space), and I wanted to address the trashed dryer duct setup. As I started into things, I realized that most of the plumbing needed to be completely redone, and the more stuff I removed, the more I discovered that needed to be replaced and redone. I tore out the lower half of two walls, at the gypsum board joint. I replaced it with 1/2" hardwood plywood, and covered it with FRP panels. I covered the joint with solid oak chair rail. Of course, most of this part isn't visible since it's behind the machines and utility sink cabinet. I patched the hole in the subfloor with 3/4" hardwood plywood. I skimcoated parts of the subfloor with Henry 547. I replaced the underlayment with new plywood underlayment, stapled down with 7/16" crown staples using my pneumatic construction stapler. I covered the floor with 18" vinyl tiles, grouted with vinyl tile grout. I replaced the baseboard with solid oak baseboard with stain and two coats of polyurethane. I did not install shoe moulding, because space is at an extreme premium in ths room. I replaced the door casing with solid oak door casing. I painted the room with Olympic ONE in Show Storm White. Mechanicals and plumbing... I redid the washing machine source water pipes and standpipe, terminating them in a new Oatey washing machine outlet box with new valves with hammer arrestors. I moved the standpipe trap to the basement, and used a trap with a built-in cleanout so I can easily deal with clogs should they ever occur. It also won't freeze since it's now in heated space. I ran new copper for the washing machine feeds, and properly installed new pipe heaters on them. They are plugged in to a new GFCI outlet I installed in the basement. I also added a GFCI outlet in the laundry room on this circuit, and plugged the washing machine into it. The dryer is on a separate circuit. I installed a DB-480 DryerBox from dryerbox.com, and ran the dryer duct downward and through the corner of the basement. I removed the old gas line and ran new black iron to the new location inside the DryerBox. I used the long-sweep ells from dryerbox.com for the dryer duct where possible. I used a Premium Flush-mount Metal Dryer Wall Vent from dryerwallvent.com because it has less airflow restriction than any other vent on the market and allows easy cleaning of the dryer ductwork because it has no grill and no hood. I also used the DryerFlex hose from dryerflex.com, since it's a better flex hose than anything available locally. All of these products lead to a very efficient and maintainable dryer duct. I removed the plumbing for the garage utility sink, but I left the option of adding it back later by installing tees and stubs using SharkBite connectors. I can add DWV for a garage utility sink if desired by extending where I now have a 3" wye with cleanout trap. Electrical... I added a new 20A circuit for the washing machine and pipe heaters. I used tamper-proof GFCI outlets in the laundry room, and a GFCI outlet in the basement for the pipe heaters. I replaced the light switch in the laundry room with an occupancy-sensing light switch, since I will usually have my hands full when I enter the laundry room. The fluorescent ceiling fixture's ballast died last weekend. Since it was a T12 fixture, I decided it was time to replace it with something more efficient: a thin LED panel light. Higher efficacy (4000 lumens, 50W), warmer color temperature (4000K), and no maintenance (it will outlive me). It's a Commercial Electric 74031/HD 1'x4' LED panel, about 3/4" thick. I wish the CRI was a little higher than 80, but it's more than sufficient for my laundry room. The paper towel holder is now installed in the laundry room. I finally started working on installing the paper towel holder in the laundry room. I cut a piece of 1/2" thick plywood to size, sanded it, and put three coats of paint on it. It will be attached to the unerside of the wall cabinet and the paper towel holder will be attached to the mounting block. I put another coat of paint on the front and side of the wall cabinet. I put some more primer on the oak piece I cut to hold the cabinet out from the wall at the bottom, then later put a first coat of paint on the parts that will be visible. I then mounted this piece to the cabinet bottom and mounted the cabinet. Finally, I put one of the shelves in the cabinet and reinstalled the doors. This cabinet is not screwed to the wall at all, it's just hanging on the french cleat. At the moment I intend to leave it that way so it can easily be removed if desired. I want to change my Stoko Vario dispensers to the white versions. I used the black ones because I already had them, but they stick out like a sore thumb in the laundry room. It's trivial to replace them, and they're not expensive. I put a second coat of paint on the back of the wall cabinet doors. I sprayed a coat of flat white on the inside of the wall cabinet, as well as the outside top and bottom. I then brushed the first coat of paint on the front of the cabinet, as well as what will be the visible side. I also brushed a coat on the bottom. I reinstalled the hinges and knobs on the wall cabinet doors. Tomorrow I hope to finish painting the cabinet so I can install it on the wall by the end of the week. I put the first coat of paint on the back of the wall cabinet doors. I put the second coat on the front of the wall cabinet doors. I removed the wall cabinet from the new french cleat and wiped it clean. I applied a coat of Zinsser B-I-N to it, and later a second coat. I also cleaned up the doors and applied 2 coats of Zinsser B-I-N. I'm using 2 coats of Zinsser B-I-N because I want to be sure that the tanins from the oak pieces don't seep into my final finish. Before I went to bed, I put the first coat of paint on the front of the wall cabinet doors. I cut 1/2" off of the top and bottom of one of the old cabinets from the laundry room. It was too tall to use above my hand cleaner dispensers. I created a French cleat and installed half of it on the laundry room wall above the utility sink, and the other half on the cabinet. I tested the fitment of the cabinet on the wall, it fits. I need to prime and paint this cabinet (white). The second old cabinet has water damage to a side and the bottom. Hence I don't intend to use it, though I may save the face and doors and re-use them. The main objective of doing this work right now is getting the cabinets out of the dining room where they've been sitting on the floor for almost a year. Two Stoko Vario dispensers are now installed above the utility sink in the laundry room. A third is on its way from jdindustrialsupply.com. These dispensers will hold Kresto (for typical hand cleaning), Cupran (for paint, glue and tar) and Reduran (for dyes and inks). I already have Kresto and Cupran, and I ordered a 1000ml soft bottle of Reduran. Having these dispensers on the wall will help keep clutter out of the laundry room; no soap bar or bottles of soap on the tiny edge of the utility tub. They're also useful on work jeans and coveralls. I put a coat of paint on the oak plywood on which I intend to mount some Stoko Vario dispensers in the laundry room. I mounted the plywood to the wall above the utility sink. I cut, routed, sanded and primed a piece of oak plywood on which I intend to mount some Stoko Vario dispensers in the laundry room. The chrome foldable laundry valets arrived. I like them, despite the fact that the engineer that designed them isn't terribly smart. The spacing of the mounting screws is such that you'll only get one into a stud. Logically the right place for that screw would be the center top of the mount, since that's where the most load would be experienced. But he didn't put a screw hole there. There are 3 holes at 120 degrees from each other on the circular mounting plate, with one at the bottom (which will essentially carry no load at all). If he flipped the mounting plate over, it'd be a near perfect design. Instead it's just OK. I'll probably use them anyway, but I wish I had noticed this before I ordered them. I ordered some laundry valets from Amazon. I'll use these to hang clothes fresh out of the dryer. I put expanding foam around the dryer vent in the interior. I insulated the joists overhanging the garage floor, and installing the plywood panels on the bottom of the joists. The insulation and plywood panel installation took a long time because there is no room to work under there. It was not easy using the staple gun to hold the insulation in position, and I had to use my floor jack to hold the panels in position while I drove screws with my small Bosch impact driver with my arm fully extended to my side while lying on my back. I cut and installed a new piece of 1/2" thick hardwood plywood to replace the piece of sheathing the previous owner had cut out of the wall. The laundry room is all buttoned up now except for a little more insulation work in the basement and some expanding foam to seal joints from insects and mice. I bought the GreatStuff Pest Prevention formula for that task. Given how long mice were inhabiting this area, I expect them to relentlessly pursue reentry. I need to make sure that something that tastes awful is on all edges they could get their teeth in. And of course I need to get around to installing new garage door seals and my new garage door openers. I taped the remaining joints on the dryer duct. It is very rigid now, I don't think I need to worry about the joints separating. I went to Home Depot to get new longer water source lines for the utility sink, DAP 3.0 outdoor caulk for the dryer vent and a 24" T12 bulb for the pantry light. It appears that the ballast in the pantry light is going south, it flickers even with a new bulb. I intend to replace this lighting with LED, so it's not a big deal. I hooked up the utility sink. I had trouble with the el-cheapo trap that was included with it. I wound up using the old one. All is well for now, I don't see any leaks. I installed the dryer duct and caulked it. After it sets up well, I will use expanding foam on the inside just to provide a little bit more barrier and support and to seal off the joint. I really like the new dryer vent, it is less constricting than any other design I've seen and will make it trivially easy to clean the dryer duct. I installed the outlet box for the outlet in the basement for the pipe heaters. This will also serve as the junction box for the new outlet in the laundry room. I then drilled 5/8" holes through the few joists where I needed to pass 12/2 wire, and ran the wire through it. I then connected everything at the outlet for the pipe heaters, and buttoned up the outlet. I then connected the wiring to the ground bar, the neutral bar, and finally to a 20A breaker in the secondary load box. I turned the load box back on and tested the GFCI on both of the outlets. It's all good. The washing machine and pipe heaters are now on their own 20A circuit with GFCI outlets, while the dryer is on a separate circuit with a GFCI outlet. The previous owner installed D-Squared HOM spacers in the QO load box, and they don't fit correctly at the face plate. I'll pick up some QO spacers at Home Depot the next time I'm there. At this point, I have a functional laundry room. I just need to finish up the work under the joists and foam the dryer vent area in the interior. I should be good for many years once that's done. Of course I still need some laundry valets to hang things in the laundry room, and a pull-out drying rack to dry sweaters and the like (maybe over the utility sink). I also need a new fluorescent light fixture; the existing one has a broken cover and a magnetic ballast that buzzes annoyingly. I stopped at Lowe's on Telegraph in Bloomfield Hills on my way home. I was so annoyed by the service at the checkout that I walked out and left my cart. First it was the cashier taking 10 minutes to check someone out with two items, while three other Lowe's employees stood behind her and did nothing. Her aisle was the only one open. Then she allowed someone to cut in front of everyone. I asked if it was store policy to allow people to cut in line. No response. So I left my cart where it was and walked out. I won't be returning. My experience at this store has been abysmal compared to the store in White Lake. Poorly staffed and poorly managed. I then went to the Home Depot down the street and picked up a piece of oak for my threshold transition, some clamps and foil tape for the dryer ductwork, and some large hammer-in insulated staples for some of the electrical work that remains. I used the self-checkout. I installed the threshold transition by caulking the underside and then nailing it with my pneumatic finish nauler. I then installed the door casing. I finished assembling the utility tub cabinet and positioned it. It's ugly but it'll work for now. However, the water feed hoses are too short. I'll need to get some longer ones tomorrow. Given the reviews for this sink, this is a good thing. Many complained about the included lines leaking at the crimps. I think Home Depot SKU 405183 is long enough. I taped and clamped the remaining dryer duct joints in the basement. The duct is good to go there. I need to do the same for the area under the floor joists. I stopped at Home Depot to look for a transition piece for the door threshold, to replace the old one. They didn't have anything in the store that matched. I may have to get something different, or order from Lowe's. I finished working out all of the dryer ductwork. All solid, no flex hose. I need at least 3 more 4" clamps to get it all fastened together, and I need some aluminum foil tape. I put a second coat of polyurethane on the door casing. I also put a second coat on the exposed MDF edges on the bottom of the utility sink cabinet. I opened the subpanel in the basement, and found a pile of breakers in the bottom. Only one of them is a single-pole for 120V, and it's 20A. I'll try it for the circuit I ran into the laundry room, which will also likely be used for the pipe heaters on the washing machine water lines. I cut the pieces of door casing for the laundry room door, and put the first coat of polyurethane on them. I started to assemble the utility sink cabinet. I put a coat of polyurethane on the exposed MDF edges on the bottom, just to help prevent water damage. The cabinet is flimsy, as I expected for the price (cheap). I will be improving it a tiny bit by adding a back; it doesn't come with one. I might just use the extra underlayment left over from the floor work, and staple it on or nail and glue it on (and paint it white). I don't really expect to keep this cabinet indefinitely, I'll be making my own at some point out of hardwood plywood. I stopped at Home Depot on the way home to pick up a 4" tee and cap to try my lint cleanout trap idea, a 24" long piece of 4" diameter duct, six worm-drive clamps and a flex pipe just to temporarily fit all of the pieces in the basement until the 45-degree long-sweep ell arrives. I removed the plywood panel I installed last night, and cut and refit the duct into the dryer box after disconnecting it from the dryer's transition duct. I believe my new plan is going to work fine, and I will not have any ductwork in the garage. And it'll all be fairly accessible for cleaning, even the transition duct, without moving the dryer. To put the cap on the bottom of the tee, I used a Malco 5-blade crimper that I bought at Home Depot to crimp one end of the tee. The cap fits snugly, and will be mostly concealed once I put the plywood back in place. I connected some of the ductwork, and connected an aluminum flex hose for the remainder until the 45-degree ell arrives. I did my first load of laundry, and all went well. I still need to install the new dryer vent, and of course I stilll have plenty of buttoning up to do on the underside of the floor. I removed the remaining moisture and mouse damaged insulation from the floor joists overhanging the garage floor. I then cut and installed a 2x4 on one of them so I can use two pieces of outdoor plywood to cover the joists and have a good piece to screw to for both panels. I then took a measurement of where the hole for the dryer duct needed to be, and cut the first piece of plywood and the hole (4.5" diameter). I then installed new pipe insulation on the pipes for the utility sink, and filled the joist areas that would be covered by this first piece of plywood with fiberglass insulation. I then mounted the plywood using my floor jack to hold it in position while I drove Torx-head deck screws into it. Tomorrow I'll do the same for the second piece of plywood. I might just use 1/2" hardwood plywood here, since it'll be lighter to handle and I expect to pull this one off later to deal with the sprinkler system piping. However, it's worth noting that I plan to insulate the garage and install a natural gas heater with separate combustion. This will essentially prevent pipes from ever freezing in the garage, though that's not the objective (the objective is to allow me to work in the garage year-round in comfort). Hmm... I finally figured out that the original dryer duct (which presumably went through the hole in the floor that I patched) took a much more direct route to the outside, by going between the cantilevered joists over the foundation, and out the edge joist under the laundry room window. And I measured, it meets code requirements (more than 3 feet from the window). I'm going to reconfigure my dryer duct (shorten it) and use this route. It means I have to remove the panel I just installed, but that's not a huge issue. This buys me precious space in the garage, and puts the duct completely out of any area that could get crushed. It also eliminates my condensation concerns. Best of all, I can temporarily run a flexible duct tomorrow so I can do a load of laundry (which I desperately need to do). And I can install my new outside vent without cutting another hole in the outside of the house. As a bonus, I believe I can install a tee right below the DryerBox in the joists, and hence have a way to clean out lint in the dryer flex hose without pulling the dryer out from the wall. I ordered a long-turn 45-degree ell from dryerbox.com to facilitate the ducting in the basement. God only knows why the previous owner hacked up the wall and sheathing to vent into the garage. He could have easily used the original dryer vent on the exterior. I'm assuming it's because he used up the space with his utility sink plumbing. But now that I've swapped the dryer and washing machine locations, that's not an issue. I could replumb the utility sink with a trap inside the basement, using pipe heaters on the water feed lines, and not have the issues he created. And in fact I may do that soon. Lynn and Craig came over to help me move the machines into the laundry room. It's done and they work. I need to do the ductwork for the dryer and finish the work on the garage and basement side. I cut all of the baseboard pieces. I also ripped the one door casing piece that needed to be ripped due to the door being too close to the wall for a full-width casing. I installed the baseboard. Before installing it, I ran a bead of roof sealant caulk (clear) along the edge of the floor to prevent any water on the floor from getting past the bottom edge of the baseboard. I also caulked the chair rail piece with DAP 3.0 Kitchen, Bath and Plumbing caulk. Finally I caulked the top of the baseboard with white DAP 3.0 Kitchen, Bath and Plumbing caulk. I started grouting the floor. Given that the grout is acrylic based, I had to do only a handful of tiles at a time before going back to wipe with a grout sponge and microfiber towel. The grout has a very strong bond, you don't want to let it dry on the tiles. Especially vinyl tiles. With ceramic tiles, you can always go back with acetone to get haze off the tiles if necessary. That's not an option with vinyl tiles. I'll finish the grout tonight so it can cure for at least 12 hours before I consider moving the machines into the room. I put a coat of stain on the oak door casing pieces, which have not been cut yet. I put a second coat of polyurethane on the baseboard moulding. I put four more coats of Henry 336 Bond Enhancer on the underlayment, allowing each one to dry to the touch before applying the next. Henry 336 Bond Enhancer is so thin that the underlayment soaks it up even after many coats. I wish I had put a coat of thick latex paint primer on as the first coat, it would have made for an easier job. It might need another coat before I can call it ready for the tiles. I guess the good thing about this process is that the Henry 336 Bond Enhancer should have a very solid bond to the underlayment since it penetrated so far. Not just a chemical bond but also a mechanical bond. And it dries fairly quickly. I was later able to lay most of the tiles (all but one) before suffering exhaustion. Tomorrow I should be able to cut the baseboard pieces, grout the floor, then possibly install the baseboard pieces and get some caulking done. The door casing can wait a day or two; the objective is to finish what can't be done once the machines are in place. Craig will likely be helping me move the machines into the room this weekend. I need to buy some shoe moulding, I forgot to buy some. I installed the new HVAC register that I bought yesterday. I patched and skimcoated more of the subfloor with Henry 547. I wanted to do more, but I've managed to misplace my second box of Henry 547. I believe it's sufficient. I cut the underlayment pieces and stapled them down with the Hitachi N5008AC2 construction stapler. It seems plenty firm. Worth noting that most of the floor (all of if that will not be under machines and utility tub cabinet) is from a full sheet, so there are no seams where there could be foot traffic. That sheet doesn't end crosswise until near the middle of where the machines will be located, and lengthwise goes all the way from the door to the far wall. It is 88.5" x 48", and the other piece is only 86.5" c 18". I put a coat of Henry 336 Bond Enhancer Self-Stick Tile Primer on the top of the underlayment. Here's a picture from when the Henry 336 was drying. I stopped at Lowe's and bought some oak door casing. I stopped at Home Depot and bought a 6" x 10" register to replace the one the previous owners painted thickly to the point where it didn't function correctly. The one I bought has a directly attached recessed lever to open/close the flaps (reliable), and the front louvers can be pointed in any direction left to right. I cut the chair rail moulding to use as my transition piece on the walls. I now need to put some polyurethane on it and the base moulding. I also stopped at Performance Tool and bought a Systainer SYS 1 to hold my new pneumatic 7/16" crown stapler. I wanted a second one to hold my pneumatic narrow crown stapler, but they only had one in the store. I cut the chair rail pieces. I put the first coat of polyurethane on them, and also on the base moulding pieces. Where possible (joist underneath), I screwed down places in the subfloor that were moving or squeaking. I hope it's sufficient once I staple down the underlayment. I have my doubts, but the only certain way to find out is to continue. Probably worth noting that very little of the floor will be exposed once the machines and utility tub cabinet are in place. I prepared to put a skim coat on the subfloor to even out the plywood seams that don't quite match up. All I did was vacuum and put the drill, mixer and bucket in the room. I nailed up the chair rail. I'm debating whether or not I leave it stained. It looks lovely on its own, but I may later decide to paint it white. I won't be able to decide until the floor tile is in and the baseboards are placed. Of course, most of this piece is going to be completely hidden by the machines. Back to work today at my new job, so not much on the agenda. I stopped at Lowe's and bought some Minwax Early American stain, two pieces of oak chair rail to use as the transition piece between the FRP panels and drywall on the walls, and three tubes of white DAP 3.0 Kitchen, Bath and Plumbing caulk. I put a coat of the stain on the chair rail pieces, as well as on the oak baseboard pieces I bought weeks ago. Tomorrow I'll put the first coat of polyurethane on them. I caulked the gap between the DryerBox and the plywood and FRP. I also caulked the rightmost edge of the FRP to the painted wall. The utility sink plumbing holes were filled with expanding foam. Hence the wall is pretty much impermeable at this point except for the 240V electrical outlet (which I'll likely cover with tape since I won't be using it) and the washing machine outlet box. I'm not very concerned about water in those locations, they're up high. I might foam tape the washing machine outlet box cover to the FRP, but water that enters the washing machine outlet box should just drain down the standpipe. My main areas of concern were the DryerBox and the utility sink plumbing, since they're low and near the sink where water may be splashed. As long as I do a good job caulking once the floor and baseboard are in, I should not have any problems with moisture for a long time to come. I forgot to buy new door casing moulding pieces. I want the EverTrue 0.625" x 2.25" interior stain grain red oak casing moulding, pattern 356. I'm starting to think I should replace part of the subfloor. It was poorly done by whoever added this addition, and it has some water damage. If I can get it to stop squeaking, I'll keep it. Otherwise I'm going to cut out a section of it and replace it. Well, I awakened to find a few vinyl tiles had fallen off the wall. I removed the remaining tiles. some of them were stuck to the wall very well, while others nearly fell off. I'm not sure what the problem was, since I rolled them with a heavy-duty floor roller with all of my strength. I suspect that the hardwood plywood just isn't the right surface, or that it needed more coats of Henry 336 (though I did two fairly liberal coats). I decided to execute the backup plan: FRP (fiberglass reinforced plastic) panels. The advantages: one large sheet and hence no gaps to worry about moisture permeation, and FRP adhesive troweled on with a 3/16" x 1/4" V-notch trowel. It's not going to come off the wall without me intentionally removing it. Remember there are two coats of polyurethane on the back and sides of the plywood, so it should not easily accept any moisture. And the adhesive should not be susceptible to moisture once cured (which takes a full week). The panels I bought are scored to look like ceramic tile. of course they don't really look like ceramic tile if you look closely, since the grout lines are perfectly machined. I used Liquid Nails FRP-310 to adhere them to the walls, which is a specific adhesive for FRP. I used an inside corner piece made for the panels where the panels meet, and I caulked botht he outside of it where it meets the larger panel and the channel that holds the smaller panel. It should be watertight. Of course I had to make two runs to Home Depot to get this corner piece, since I just grabbed from the bin and ran on the first visit and the wrong pieces were in the bin and I didn't check. Sigh, too common at Home Depot due to lazy customers. I nailed the plywood to the walls using ring-shank drywall nails. The staples I used yesterday were just to hold it in place for nailing; they have little shear strength, and given that I can't find divergent staples locally, the ones I used would probably have a tendency to pull out. I sanded my spackling. I'm basically ready for paint. I went to Home Depot and bought some Henry 336 Bond Enhancer, a paint tray and some 3/8" nap roller covers, paint tray liners and hydraulic cement. The hydraulic cement is for another project in the basement. I put the first coat of Henry 336 on the plywood on the walls. Its consistency and color is like milk. Since the plywood was bare, it soaked it up. I should have read the coverage on the bottle; I bought 2 gallons and I'll be surprised if I use more than half a gallon on the walls and underlayment. Better to have too much than too little, of course. While waiting for the Henry 336 to dry, I cut the plywood to go under the floor trusses in the garage. I then put the second coat of Henry 336 on the plywood on the walls, and the first coat of Olympic ONE Snow Storm paint (eggshell finish) on the walls. I like the Olympic ONE so far; it's a paint and primer in one, and the coverage is very good and it's thick. I later put the first coat of paint on the ceiling, then the second coat of paint on the walls, then the second coat of paint on the ceiling. I started putting the vinyl tiles on the walls. I'm having second thoughts about it; I don't know that the adhesive will hold up over time. My backup plan is FRP (fiberglass reinforced panel). Insulation is now installed on the washing machine feed pipes in the wall. I moved the light switch upward to not interfere with the work of installing the plywood on the walls. This also means one less hole to cut in the plywood. This was a lot more work than it should have been; there were 4 circuits in the light box, and the ground wires were cut WAY too short and crimped and soldered with a ferrule deep in the box. Sigh, I hate dealing with other people's hackery. At any rate, the box is moved and the light switch is functional again. I finished the remaining insulation in the wall. I then cut the hardwood plywood piece for it, whose backside was coated with hardwood floor polyurethane a week ago. Cutting this piece wasn't trivial since there are many cutouts in it... one for the washing machine outlet box, one for the DryerBox, one for the old 240V dryer outlet, and 3 for the utility sink. But I used a brand new plywood blade in my circular saw, along with my Bosch jigsaw. You kow what they say... measure twice, cut once. My first cuts were all perfect, except at the edge that touches the outside wall. That wall is incredibly crooked and I didn't feel like using craft paper or the like to match its curve. That joint will be caulked later, and will of course be completely hidden by the washing machine and its pedestal anyway. I then installed the other piece of oak plywood on the wall with the door. The previous drywall there had a big hole cut in it and was water damaged near the floor. I did some more spackling, this time with the 4" knife. This should be my last application of spackling. I'll sand and put the first coat of paint on tomorrow. I need a gallon of Henry 336 Primer from Home Depot. I finished the gas line work, though I haven't leak-tested it yet. I cut and threaded the gas lines myself from black iron, since I didn't want to spend a bunch of time running back and forth to the hardware or big box store to have them cut and thread pipes for me. Plus there's a lot to be said for being able to measure and cut as you go when you need to weave around a few things. To do this work, I bought the pipe threader from Harbor Freight (not a great tool, but with lots of cutting fluid and patience, it does the job). I also finally bought a 14" Ridgid chop saw, which I've needed for about 10 years. It worked fine too, though the stock blade on it is pretty lousy. I did buy another blade (Diablo brand) since abrasive chop saws tend to go through blades quickly. I had to turn off the gas to the house at the meter, since there are no shutoff valves anywhere upstream of the old pipe I had to remove. But I'm done, the gas is back on and I'm fairly confident that my pipe connections will not leak (I used gas line thread tape, I've never liked plumbers putty). I also cut the panel to cover the giant hole in the wall that went to the garage from the laundry room. I installed it temporarily using my new staple gun that shoots 2" long 7/16" crown staples. I need to tweak the framing I did, so I didn't install it permanently. Speaking of the staple gun, it didn't come with a case. I need to see what size Systainer it will fit in. It looks like it will fit in a Systainer 1. I spackled some of the room. Mainly where the holes were left from the removal of the cabinets. I forgot to buy pipe insulation today. I'll need to do that tomorrow. However, weather foiled the notion of cutting any plywood. So I'm working on moving the gas line and installing the pipe warmers. Yet another indication of hackery by the previous owner... he used the same Frost King pipe heaters that I bought. However, he violated the instructions in numerous ways. First, he coiled the cable around the pipe. Second, he used the same cable for two different runs. In the instructions, note the big warning at the bottom: "WARNING: Do not spiral cable around pipe or cross cable over itself. Do not use one run of cable for two different pipe runs. Failure to comply may result in overheating and fire." I'm starting to think that the previous homeowner was illiterate. :-( During inspection, we noted that the sprinkler system was fed with PVC (which had burst). I don't know which part of "NOT FOR PRESSURE APPLICATIONS" written all down the side of the pipe he didn't understand. My conclusion at this point is that he could not read. At any rate, the new pipe heaters are installed, correctly. They run from just over the top of the foundation all the way to the underside of the washing machine outlet box. Exactly 6 feet, which is the length of the heaters I bought. I used Nashua 557 duct tape (rated for 200F in-service temperatures and code-approved), then wrapped the duct tape in green powdercoating tape (rated for more than 400F). I then installed pipe insulation on the pipes under the floor, to help retain heat from the pipe heaters and also help keep condensation away from the fiberglass insulation I plan to install. Unfortunately I forgot to buy pipe insulation for the wall today, I'll do that tomorrow. Having very little space behind the DryerBox, there was no room for effective use of fiberglass insulation. So I foamed it in with Great Stuff expanding foam. It worked well. As a bonus, the duct to which the DryerFlex will be attached is now firmly held in place. I finally got around to removing the remaining plumbing for the utility sink that was in the garage. When I went to remove it from the sink, it just fell off. Both hot and cold lines apparently froze and burst out of the compression fittings a long time ago. Sigh, why do people do such stupid things like run uninsulated and unheated water lines into an unheated space in Michigan? If there was one place that most needed pipe heaters, it was this sink. Of course they would have run for many months every year, but that's better than letting the pipes freeze, break and leak. I still need to deal with the sprinkler system feed. Of course I've no idea where there are any sprinkler heads, or a sprinkler control box. The valves are behind the garage, which leads me to believe that for some ungodly reason, the back yard had sprinklers while the front yard did not. The previous owner was a landscaper; you'd think he'd know better than to use PVC to feed a sprinker system, but alas... he did not. In any event, I don't even see wiring for a control box anywhere. Hmm... I'll have to backtrack from the valves. I'm starting to think there was never any control box, but why bother having a PBV and valves with no control box? I removed the piece of plywood the previous owner used to cover the underside of floor joists that cantilever over the sill plate. I don't know what he was thinking. I'm starting to think he was dumb as a shovel. It was not outdoor-rated plywood, and was only 1/2" thick. But much worse was the fact that it didn't provide anywhere near full coverage. So essentially he built a mouse nest. And there was about 5 lbs. (not exaggerating) of mouse droppings on it, along with one mouse skeleton and a whole lot of seed shells. It was also damp from the standpipe trap he had put inside the wall which cracked from freezing water. I have been seeing mice in here (from the basement side, on top of the sill) every day I've worked this week. One of my traps has disappeared, presumably it fell down inside the foundation cinder blocks. I had put one near the spot where the owner had cut out the sill plate and part of one of the cinder blocks for PVC for the utility sink in the garage... another stupid move. He removed the PVC trap for it before he left, probably because it froze and burst. Just the same, there was no need to cut the sill plate or take a chunk out of the cinder block... all the other plumbing goes over the sill. Sigh, in the words of Ron White... you can't fix stupid. Note that all this hackery left the basement wide open to the garage. An adult raccoon could've climbed through if he got in the garage, because there was full inter-joist access to the basement. Lord only knows what his heating bills were like. The PVC for the washing machine standpipe... I didn't realize that the 3" pipe it leads to was schedule 30 before I cut it. All of the new pieces I bought (as well as some of what I removed) are schedule 40. They don't fit together. Thankfully, Craig delivered an adapter for me and I've installed it along with the 3"x3"x2" schedule 40 wye. I also installed part of the cleanout trap, and made a piece with a coupling to drop in from above so I can take my final measurements for the standpipe run. Before finishing the standpipe run, I finished the hot water feed for the washing machine. That's because the standpipe needs to run nearly parallel to the water feeds, at roughly the same height, and between them. All due to the way the washing machine outlet box is arranged (standpipe in center) and space constraints since we're running over the foundation sill. I then did the same for the cold water feed, and finished the standpipe run. I tested the standpipe and the cold water feed by running a hose from the end of the cold water valve in the washing machine outlet box into the standpipe and opening the valve for 5 minutes. It works well, and the plumbing looks a lot tidier than what was there previously. Obviously it helps that I deleted the bursted PVC for the sink in the garage, and that I now have a 2" cleanout trap in the basement instead of a non-cleanout trap hidden in a poorly insulated exterior wall that had a large hole cut it in it. Off-topic, but a big time-saver... Julie mowed my lawn for me. She's the best! The dryer box and other parts arrived from dryerbox.com. All of the parts are _very_ nice, I highly recommend them. The LT90 ells, once assembled, are so much longer and less restrictive than a typical 4" elbow. They're smooth, and there's a label on the side indicating that they add no restriction (U.L. tested and approved). Hence you don't need to subtract any more than their length when doing your run calculations, unlike a typical elbow. They're 18" long. The DB-480 dryer box is also very nice, as is the Dryer Flex hose. So is the DWV4W flush-mount dryer vent. With some help from Julie, I removed the overhead cabinets. Only one of them will remain in the laundry room, but it will be relocated to be above the utility tub. This is because the cabinets were mounted too low to be used above the laundry machines; per their manuals, they require more ventilation space than was possible with the machines on the pedestals and the cabinets above them. There was essentially no space above the machines with the cabinets in place. Also, the GFCI outlets need to be accessible for the test and reset buttons. That wasn't possible with the cabinets in place. If I raised them, they would essentially be unusable. Finally, I want a longer closet rod than the extremely short one that was previously installed. With machines this size, a very large of laundry might need to be removed from the dryer and hung. Much more than what could have been hung on the previous rod. I sweated copper pipe to the washing machine outlet valves. I cut the hole for the dryer vent and the gas line to enter the dryer box. Everything fits well. I installed the two outlet boxes, with their bottoms approximately 55" from the subfloor. This should put them _just_ above the top of the laundry machines when I'm done. I ran the wire to them, and installed the tamper-proof 20A GFCI outlets. Note that right now, only the right outlet (intended for the dryer) is connected to the breaker box. I have not yet run the wire to the breaker box for the left outlet. I'm also not sure the subpanel in the basement where I intended to add the breaker is up to code. I haven't opened the breaker boxes yet, but it sure looks to me like the subpanel is wired in parallel from the utility company feeds. Potentially a disaster waiting to happen. This subpanel looks to have been installed by the previous homeowner and I'd bet it's done incorrectly. The fact that I don't see a breaker for it in the main panel is a dead giveaway, but the breaker labelling in the main panel is poor (difficult to read). I set up my air compressor's filter and regulator temporarily on pegboard, so I could regulate the air pressure to my nail guns and staplers. I then nailed a piece of 2x6 on the top of each of the portions of the wall plate that the previous owner had cut big holes in for plumbing, standpipe and dryer vent. Using my new hole saws, I cut holes in the wall base plate for the new plumbing and standpipe for the washing machine. Since I couldn't find a template from Oatey, I used the holes in the bottom of the Oatey washing machine outlet box to make sure my holes were in the right places. I also oversized the holes for the water feed pipes, which I will gap-fill with Great Stuff expanding foam once all of the plumbing is in place. I cut and capped the PVC for the previous standpipe. The previous standpipe went through one of the wall studs to a wye at the utility sink drain pipe. I'll be running it straight down and then above the sill to a P-trap with cleanout that's accessible from the basement. This allows more insulation in the wall than what the previous owner did (trap and lots of 2" PVC in the wall, impossible to clean the trap), and keeps the trap in heated space. Given how the old system was set up, I suspect the previous owner had problems with the water in the trap freezing. That would explain the water damage to the wall below the old washing machine outlet box. I used Great Stuff expanding foam to fill remaining gaps from the previous owners wanton drilling of holes through the wall base plate and floor. I took a look at what I need to complete plumbing-wise for the washing machine. It's not bad, assuming I use a SharkBite fitting as the last elbow fitting. The PVC for the standpipe will be a little trickier. In terms of order, I'll do the SharkBite elbows last, since they're the easiest to connect. I need to do some elctrical work first; both of the GFCI wall outlets I intend to use need to be raised above my intended trim strip between the tiled part of the wall and the drywall, so they're accessible for test/reset. I will also need an outlet in the basement for the pipe warmers. Ideally this outlet would be on the same breaker as the washing machine. Another trip to Home Depot to pick up my order of Shark Bite plumbing fittings, the Shark Bit safe seal tool, electric water pipe heat cables, a Rigid 104 tubing cutter, a plumb bob and some mason line (for the plumb bob). I gave up waiting for the pipes to dry in the basement. They continue to drip even after letting them drip overnight. That's with all of my shutoff valves closed, the pressure tank depressurized and the well pump unplugged. The LG WDP5W pedestals arrived. I'm working on the plumbing for the washing machine. I've got the SharkBite tees installed on the supply in the basement. I created capped stubs for the garage utiliy tub feed, since I don't really anticipate using that tub but may change my mind later (it will need an indoor trap and supply line heaters to avoid freezing). Given that I'm not sure how much I can trust the SharkBite connectors on the old plumbing, I'm trying to use sweated connections where I can. So for now I've got the SharkBite tees leading to elbows and short connectors that I sweated together, and then SharkBite ball valves. I'm using the SharkBite ball valves due to being able to spin them if needed for access. I turned the water back on, and all is well. The tees I capped (for the previous washing machine feeds) do not leak, nor do any of the fittings I installed today. Next up is placing the washing machine outlet box and plumbing to it. Unfortunately I haven't found my hole saw kit, so I'm not yet able to cut the hole for the 2" standpipe. And I've not yet figured out what I'm going to do with the mess the previous owner made with PVC for the standpipe, laundry tub and garage sink drains. There doesn't appear to be enough pipe left in that area to cut and couple, so I'll probably need to replace a decent amount of PVC. It also doesn't appear to slope correctly, but I haven't put one of my levels on it yet. I went back to Home Depot after dinner with Julie to pick up a Milwaukee 49-22-4025 hole saw kit (3/4" - 2.5"). I also bought 10' of 2" Schedule 40 PVC to use as the washing machine stand pipe, and a 3"x3"x2" wye. I'll need more fittings, but these are ones I am certain I'll need and I need the 2" straight pipe now so I can get the washing machine outlet box installed and the holes drilled in the wall base plate for it. I want an accessible clean-out trap, the Nibco C4884 from Home Depot (store SKU 640887) looks like the answer. Ideally this trap would be somewhere that won't freeze. I need a waste water routing plan for the washing machine. I removed the last two sections of the gas line that was sticking up through the floor. Fortunately it had a valve in the basement, and I also capped the line. I will be moving the gas line into the new dryer box when it arrives, so it'll be recessed in the wall. I tested that the machines and the new utility tub cabinet will fit by using the pedestals and the cabinet base. It's a near-exact fit; a little over 1" between each item, and from the walls. I verified that a typical Tide laundry detergent bottle fits in one of the pedestal drawers. This is good news, since it looks like I'm going to have to remove one of the wall cabinets and move the other to be located above the utility tub. This is because the machines are too tall on the pedestals to allow for proper ventilation. Note that the electrical outlet in here is not GFCI. And though it's on a 20A breaker with the correct wire, the outlet itself is a 15A outlet. It would not pass an electrical inspection, and would not have passed inspection for the last decade. 2008 NEC and later requires receptacles within 6' of a utility sink to be GFCI. 2011 NEC 406.12 calls for tamper-proof GFCI in essentially all child-acccessible locations (not behid a difficult to move appliance or more than 5.5 feet from the floor). I made another trip to Lowe's for a bunch of stuff to move the plumbing for the washing machine. Benzomatic TS8000KC MAP Pro Torch Kit, Lenox 4.125" bi-metal arbored hole saw, fiberglass insulation batts, Oatey 38970 quarter-turn ball valve copper sweat washing machine outlet box with hammer arrestors, solder, solder flux, pipe cleaning tools, in-line gate valves, elbows, tees, couplings, caps, copper pipe, severe weather plywood. I will be doing some of the plumbing work tonight. At a minimum I'll get the existing plumbing removed and capped (I have no choice but to cap it, since the previous owner put no valves in the basement for it; the mains have to be shut off). Hopefully I'll get more done, but we'll see. Sigh, 2 hours of my day wasted thanks to the lousy cashier at Lowe's. She didn't give me one of my bags, which had all of the important stuff in it for today: solder, solder flux, gate valves, copper end caps, etc. She could've called me (I used my MyLowes card), or just chased me out the door. But she didn't, so I spent an hour looking for the stuff thinking I had misplaced it then another hour going to the store and back. Well, I've confirmed that the laundry room was an addition. Of course I suspected this all along, but it wasn't until I took a good look at the framing underneath that I realized it. Note this also explains the terribly positioned wall in the basement (that I removed because it severely constrained the entrance to the basement); that wall provided support for the hackery they did to the original floor trusses. I'll put an engineered beam or iron beam and jacks in its place. As part of the terrible work that was done here, the sill was cut and a top brick was notched for the drain of the sink in the garage. And the hack work done here leaves the garage open to the basement for mice and cold air to enter (and yes, there are mouse droppings to prove it). And with the lack of insulation, the previous owner's plumbing had a plug-in pipe heater wrapped around the plumbing for the washing machine. However, it wasn't plugged in and I don't see where he had it plugged in. This isn't trivial to fix correctly. I'm tempted to delete the room entirely and recapture the space where it intrudes into the garage. First floor laundry is nice to have, but not if it's a terrible hack that causes a lot of problems. I'm going to disconnect the utility sink in the garage for now. The way it's plumbed, it's a frozen and burt pipe situation waiting to happen. The drain isn't connected right now, and I don't know if it was ever connected. I'll use SharkBite tees so it can be plumbed later if desired. Given that I was unable to completely drain the pipes in the basement, I've decided to use SharkBite tees and elbows there. I'm also going to use SharkBite ball valves. I put two coats of polyurethane on the back of one of the 1/2" thick pieces of hardwood plywood that I'll be using for the drywall replacement. I went to Lowe's and bought parts to fix the hole in the floor. A 2' x 4' piece of 3/4" thick oak plywood, some exterior wood screws, a 6" long 3/8" diameter carriage bolt, nut and fender washers, and two pieces of 1"x3" solid oak. I cut a piece of the oak plywood to fit under the floor, to which I have limited access since it's beyond the sill plate. I cut a slot in it to allow for the gas line that's in the floor now (though it's likely I'll reroute the gas line to the new recessed dryer vent box from dryerbox.com once it arrives). I drilled a hole in it for the carriage bolt, then ran the carriage bolt through it from below. I put it in place from the basement, with the carriage bolt sticking up through the big hole I'm fixing. I ran the carriage bolt through the two pieces of solid oak I bought, then put a pair of fender washers and the nut on. This allowed me to squeeze the new piece of plywood tightly against the bottom of the subfloor. I then drilled small pilot holes through the subfloor and the new piece of plywood, and installed exterior wood screws to hold the new piece of plywood snugly against the subfloor. Voila, I now have support for a plywood puck I'll install in the hole in the subfloor. I then installed a puck made from 3/4" thick oak plywood, using wood glue and 4 countersunk screws. I filled the gaps and patched other spots in the subfloor with Henry 547. We'll see how things look once it dries. I've decided I'm definitely going to move the washing machine to the left and the dryer to the right, which is opposite of how things are set up now. The reason: my new front-load washing machine (and most of them available today) has a non-reversible door with the hinge on the left. To swap clothes from the washer to dryer without having a door in the way, the washer needs to be to the left of the dryer. To do this work, I need to do a decent amount of plumbing, and it's not terribly convenient due to the laundry room being a hacked-in addition. But I need to do it, and it's not rocket science. I borrowed mom's truck (thanks mom!) to buy some sheet goods from Home Depot. Two sheets of underlayment to replace the underlayment I removed yesterday and two sheets of 1/2" hardwood plywood to replace the lower 4' of drywall that I removed today. I also bought new baseboard, solid oak. I bought contrasting 12" vinyl tiles to cover this plywood once it's installed. I will be installing oak trim as a transition from the vinyl tile to the existing drywall. I also bought more of the vinyl tile grout. At Lowe's I bought 1/8" tile spacers. I also bought a Hitachi N5008AC2 pneumatic stapler, which shoots 7/16" standard crown staples. This is the correct staple size for underlayment, unlike the narrow-crown staples that some moron used on the original underlayment (all of which shot through the underlayment and hence didn't hold it down). I removed the lower 4' of drywall on the wall with the dryer duct and plumbing for the washer and dryer. This wall was not framed properly (no supporting stud for one of the drywall edges) and was hacked up by the previous owner. One hack was for the dryer duct which I'll fix, the other hacks were for unknown reasons. I ordered the pedestals (LG WDP5W) for the washing machine and dryer from Home Depot. Basically, I couldn't resist their special price. The pedestals are normally $270 each. I got them for $134 each, with free delivery (this Saturday). This puts a slight crimp in my laundry room plans, but that's OK. Having the official pedestals gives me drawer space, which means I can probably eliminate one of the overhead cabinets and use a longer clothing bar above the machines. Even if not, it's nice to have the machines at a height that doesn't require a lot of stooping to move clothes from the washer to the dryer. I also ordered some parts from dryerbox.com to make the ductwork and transition hoser installation for the dryer easier and more amenable to future changes. I ordered a K-DF-480-90 kit which includes a DB480 wall box, 48" DryerFlex hose, an LT90 long-turn ell and two 4" clamps. I also ordered two more LT90 long-turn ells, a DWV4V premium flush-mount metal dryer wall vent and a sheet of 6 dryer placard labels. These parts should arrive on Monday, July 29th. I installed a Lutron occupancy sensing light switch in the laundry room. This is a good location for such a switch, since I'll typically have my hands full with laundry baskets when I enter. I have it set to turn off in 5 minutes, though I expect to turn the light off manually most of the time; I really only need it to turn the light on. 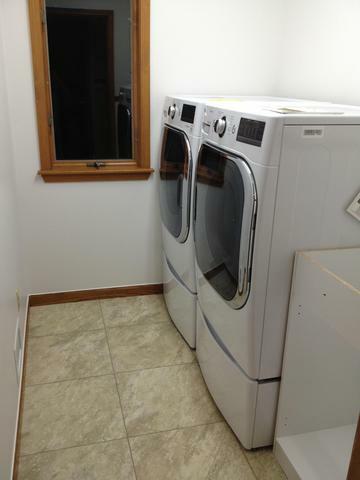 I bought a simple utility tub and cabinet for the laundry room that will allow my new washer and dryer to fit. It's the Style Selections LT2026WWMV at Lowe's. The Lowe's item number is 185379. It was $199. Reviews indicate that the included hoses are problematic, but that's easy to fix. I also bought some vinyl tiles and grout for the floor. While I would've liked to have ceramic, the subfloor in the laundry room is not sufficient for it (it's pieced together poorly with some edges unsupported). I also don't have the time to lay ceramic right now, I need a functional laundry room. However, I may wind up tearing out the subfloor anyway. When I removed the underlayment, I found ancient moisture had made its way to the subfloor. Not to mention the big hole in it that someone had cut for some reason (dryer vent?). The subfloor appears to be OK, except that it doesn't seem to be supported well in some spots. I need to look at the floor from the basement before I decide whether or not to tear it out and replace it. I need a plan for the dryer ducting and moving the plumbing for the washing machine. I'm starting to think I want to replace the lower 4' or so of drywall on 2 walls of the room with 1/2" plywood, and put the vinyl tile on the plywood too. It buys me some additional structural integrity for the dryer duct and washing machine plumbing cutout, and should also be less susceptible to moisture issues if done correctly. In addition, it's less work than tearing out the drywall from floor to ceiling; I don't have to remove the overhead cabinets, nor deal with the drywall all the way around the door.